The best 100th issue comic book covers, part 2 | 'TAIN'T THE MEAT… IT'S THE HUMANITY! 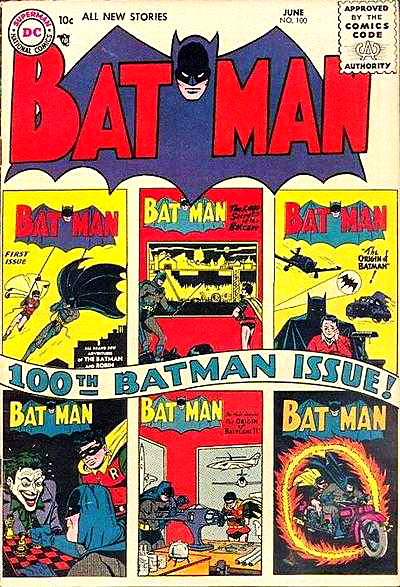 The 100th article celebrations continue here at ‘Taint The Meat with another selection of my favourite 100th issue comic book covers. I stated in part 1 of this series that 100th anniversary covers rank as some of my favourites and by compiling them for these articles I’ve seen nothing to change my mind. However, I have noticed that they tend to come in five distinct categories. First off there’s the overall tone cover, such as the ones for Captain America and The Walking Dead. These are eye-catching and bold images that represent the general theme of the title as opposed to depicting an actual scene from that issue. 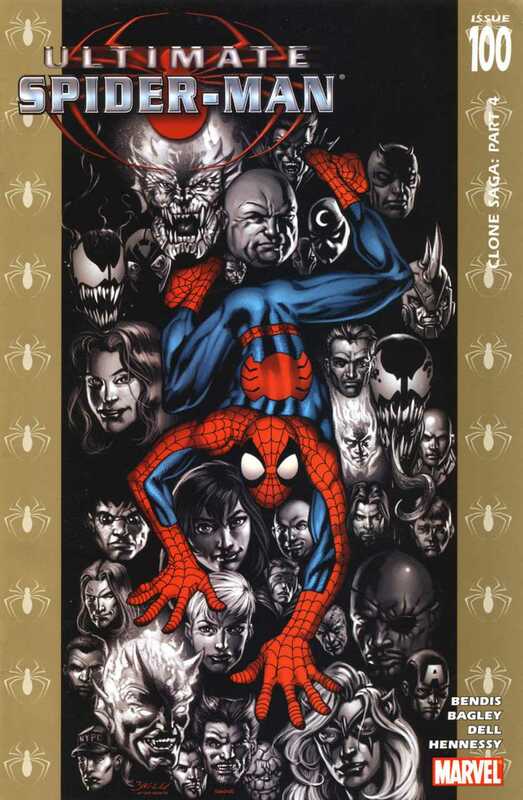 Then there’s the montage of faces cover, such as that from Ultimate Spider-Man; these covers play upon the history of the comic and remind the reader of the title’s ensemble cast. 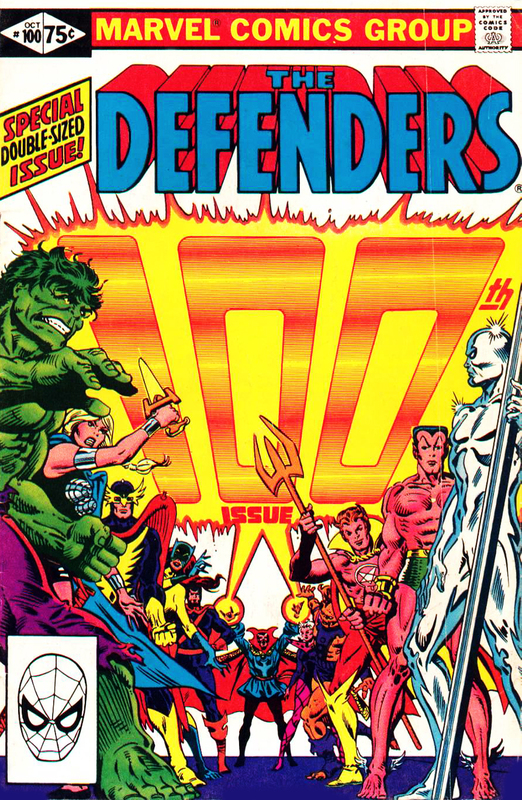 Next there’s the classic superhero line-up/face-off – two rows of characters squaring off for battle (The Defenders) – a simple but effective image. 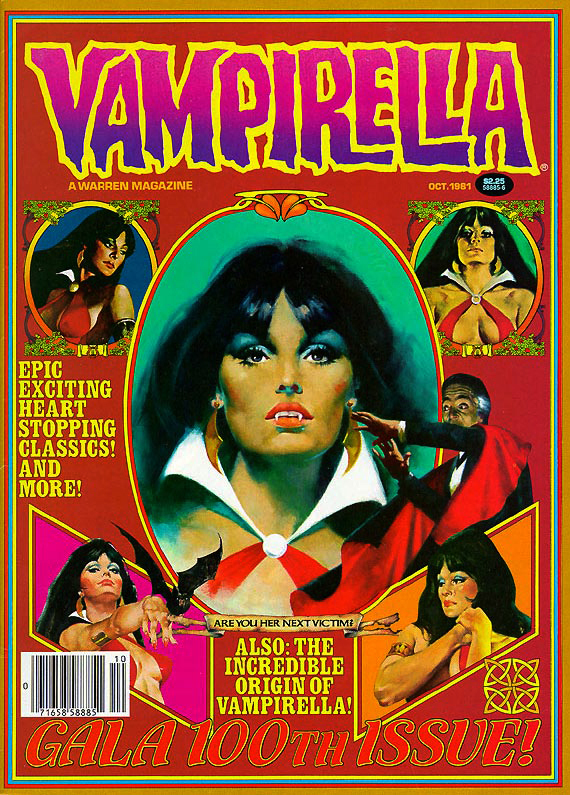 Next is the unashamedly celebratory cover that emphasises the collectability of that issue, such as the covers for Batman and Vampirella. 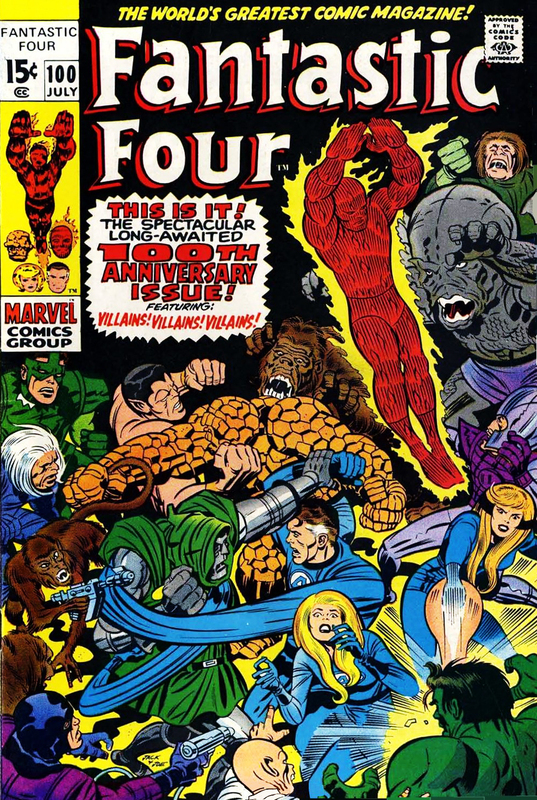 Lastly there’s the business-as-usual cover which depicts a scene representative of that issue’s story (The Fantastic Four and World’s Finest), usually accompanied by a flash drawing the reader’s attention to the issue’s number. Out of the five my favourite has to be the montage covers as they neatly combine the overall tone of the title with its history. Bit of a cheat this one as it’s actually the 100th issue of Tales of Suspense which was rebranded as Captain America from this issue onward. 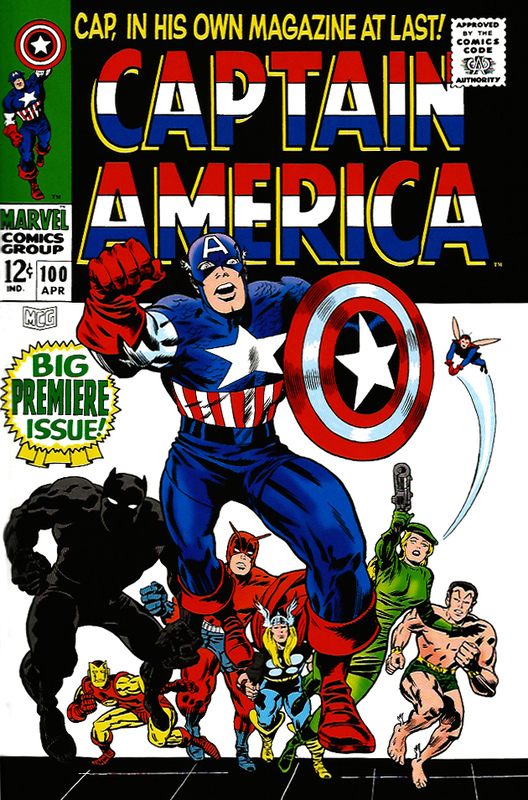 Nonetheless it’s classic action-packed Kirby (who co-created the character with Joe Simon) with Cap leaping towards the reader flanked by The Avengers. Brian Michael Bendis’s Spider-Man re-imagining hit the hundred-issue milestone with this eye-catching variant cover by the title’s regular artist Mark Bagley. The image neatly pays homage to the 100th issue of The Amazing Spider-Man from 1971. (still in print after 35 years) hit it’s 100th issue (or ‘prog’) with a montage of it’s most popular characters. 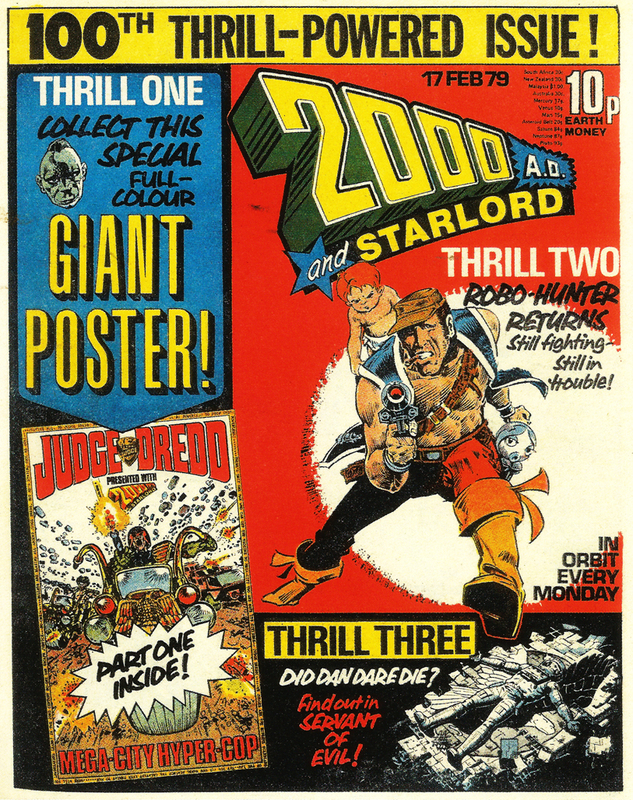 I remember collecting the giant four part Judge Dredd poster and carefully sellotaping it together before proudly pinning it to my bedroom wall. Sadly it’s long since perished. issue for the character and the industry. of the popular vampire character. I mentioned in my introduction that montage anniversary covers rank as some of my favourites, and this one is terrific. 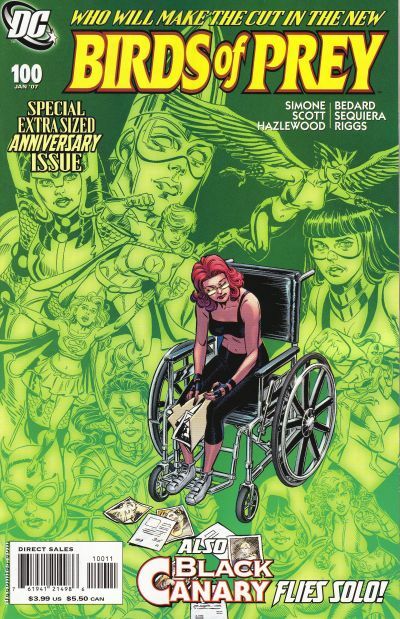 A reflective Oracle (Barbara Gordon) is surrounded by prospective new recruits for her team – a roll call of some of DC’s most powerful female characters. Simple, elegant and eye-catching. One of 15 variant covers released by Image to celebrate the 100th issue of Robert Kirkman’s hugely popular zombie comic. I must confess that I’m not actually a massive fan of this series but this wrap-around cover by Adlard is beautiful, in a hauntingly macabre way. 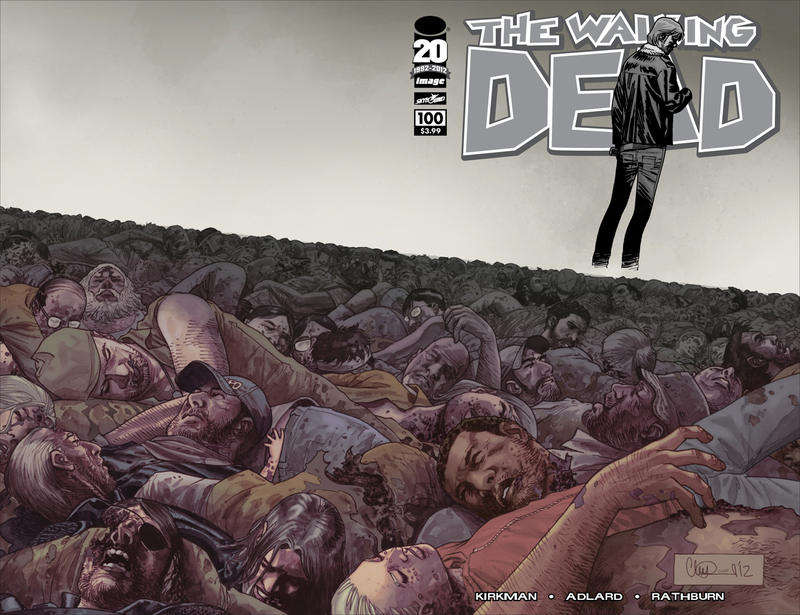 Depicting the title’s main character, Rick Grimes, standing amongst the corpses of those that have died in the series (including his baby) is a masterstroke on Adlard’s part. The Defenders 100th anniversary issue features a great superhero line-up that is clearly reminiscent of the cover from X-Men issue 100. This epic double-sized issue sees the team defend the Earth from the denizens of Hell. 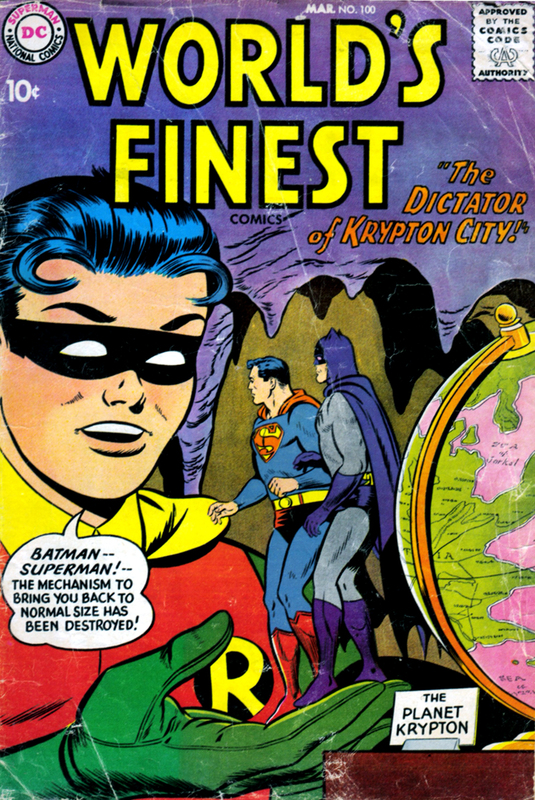 DC’s long-running anthology series (it saw print for almost 50 years) hit its 100th anniversary with a suitably pulpy cover featuring title mainstays Superman, Batman and Robin. Legendary Superman artist does a great job here with a simple yet bold cover. That’s it for this article. I’ll post the last ten covers in the next day or so (click here).